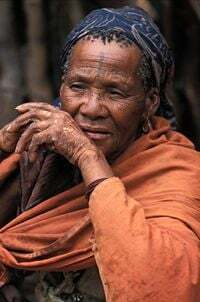 The Bushmen (also known as Khwe, Basarwa, or San) peoples of South Africa and neighboring Botswana and Namibia, who live in the Kalahari Desert, are part of the Khoisan group and are related to the Khoikhoi. They have a remarkably complex language characterized by the use of click sounds. While they have no collective name for themselves in any of their languages, they identify themselves as a larger group with such names as Ju/’hoansi and !Kung (the punctuation characters representing different clicks). Traditionally, the Bushmen have had a hunter-gatherer culture, living in temporary wooden and rock shelters and caves of the Kalahari in southwest Africa. About half of modern Bushmen continue to live this way. Bushmen have a rich folklore, are skilled in drawing, and are famous for their beautiful cave paintings. Archaeological evidence suggests that they have lived in southern Africa (and probably other areas of Africa) at least 22,000 years. Although this early advanced civilization has survived despite technological and cultural developments in the regions in which they live, late twentieth century changes in land use finally threatened the survival of their traditional lifestyle. The term "San" was historically applied to Bushmen by their ethnic relatives and historic rivals, the Khoikhoi. This term means "outsider" in the Khoikhoi language, and was derogatory. For this reason, some of this group still prefer to be called Bushmen. Opinions, however, vary on whether the term "Bushmen" is appropriate—given that this term is also sometimes viewed as pejorative. In South Africa, the term San has become favored in official contexts. Angola does not have an official term for Bushmen, but they are sometimes referred to as Kwankhala, or Bosquímanos (the Portuguese term for Bushmen). Neither Zambia nor Zimbabwe have official terms, although in the latter case the terms Amasili and Batwa are sometimes used. In Botswana, the officially used term is Basarwa,  although this Tswana language label also has negative connotations. Genetic studies of African DNA have revealed highest levels of genetic diversity in the San, suggesting that they are the oldest human population on the continent, and on earth. In 2009, an international team led by Sarah Tishkoff from the University of Pennsylvaniathat had spent ten years studying genetic material from 121 African populations, collecting over 3,000 samples, reported that they had identified 14 "ancestral population clusters." Their research also located the origin of modern human migration in south-western Africa, near the coastal border of Namibia and Angola—the homeland of the indigenous San communities. These studies suggest that the San people are directly descended from the early human ancestors of all other Africans including those who migrated to other lands and populated the world—"they may be descendents of a population ancestral to all modern humans." Bushmen from the Botswana region migrated south to the Waterberg Massif 10,000 to 2,000 years ago. Archaeological evidence indicates that most Bushmen migrated southward from an unknown location to the Kalahari desert areas within this time range. Half the current African population lives traditionally, essentially like their ancestors lived. Much has been learned about the ancient ways from the current Bushmen. They have been nomadic hunters and gatherers of wild food in traditional social units of small hunting bands. Sometimes Bushmen may form larger organizations for special occasions, but these groups are loose and temporary. They usually possess only what they can carry. The only concession most Bushmen have made to the modern era is wearing clothes. Traditional Bushmen practice shamanism, conjuring animals with sacred songs, and performing almost magical healing. Hunting is exciting and dangerous and Bushmen hunt enthusiastically in their ancient fashion. They are good marksmen and use small bows and tiny, unflighted arrows whose barbs are smeared with poison from the larvae of Chrysomelidae beetles. They use a manual communication system while hunting. They are often out several days at a time, since big game like the kudu or eland may take four or five days to become exhausted and able to be felled. Most prized is the eland, the largest antelope in southern Africa, which is significant not only because of its size but it also because of its fat. This fat is very important to the diet of the Bushmen, and also they believe it has supernatural potency. Because of the excitement, teenagers and young men of the Bushmen generally prefer hunting to drifting off to the nearby towns. They have many stories and songs about hunting. Young teenagers may play guitar and even form bands playing modern music, but the content of their songs remains about the hunt. When the men return from the hunt, all gather and the women sing and beat various poly-rhythmic patterns while the men dance in celebration of their victories. The women are usually gathering, often while the men are out hunting, and traditional gathering gear is simple and effective. They use a hide sling, blanket, and cloak called a kaross to carry foodstuffs, firewood, or young children, smaller bags, a digging stick, and perhaps a smaller version of the kaross to carry a baby. Empty ostrich egg shells are used to collect and store water following good rains, in anticipation of the hot, dry season. For those who remain nomadic, villages range in sturdiness from nightly rain shelters in the warm spring, when people move constantly in search of budding greens, to formalized rings when they congregate in the dry season around the only permanent waterholes. Early spring, a hot dry period following a cool dry winter, is the hardest season, after autumn nuts are exhausted, villages concentrate around the waterholes, and most plants are dead or dormant. Meat is most important in the dry months, when wildlife can never range far from receding waters. A long, long time ago, we, the Bushmen, roamed these mountains, masters of the unpredictable ways of nature. We were nomads then, moving with the great herds of game and the changing of seasons. When the animals migrated we followed, leaving no houses or roads to mark our presence here. All we left behind was our story painted in the rock, in the shelters, the story of sacred animals and our journeys to the spirit world. These mountains once gave us shelter and the herds of antelope gave sustenance, and meaning to our lives. Especially the eland, for it is the animal of the greatest spiritual power. For us, it is the animal of well being and healing, of beauty and peace and plenty. The eland could take us on journeys to the world beyond and connect us to God." San Rock art, Ukalamba Drakensberge, South Africa. It shows an Eland. They have left over 20,000 individual rock paintings, all preserved in caves at more than 500 different sites. Originally, when Europeans first encountered the rock art of the Bushmen about 350 years ago, they considered it primitive and crude, like the people who made it. They considered them flat perspective, two-dimensional accounts of hunting, fighting, and daily life. Twentieth-century scholars developed an appreciation for their aesthetic aspects, with fine detail and exquisite color, but still believed them to be simply portrayals of hunter-gatherer life. Another dimension to these paintings has emerged. In the Kamberg Nature Reserve of South Africa, a type of "Rosetta Stone" for the paintings was found and published in Scientific American in 1915. These painting showed how hunters gained power from the animals that they killed. The Bushmen have left over 20,000 individual rock paintings, all preserved in caves at more than 500 different sites. As more paintings were studied in this light, anthropologists decided to interview current Bushmen. It was confirmed that these paintings also represented evocation of a spiritual power. The ancient paintings show someone stretching their arms out in an odd way toward and over a fire, resembling shamans who paint and draw after entering into a trance. They believe they open portals to the spirit world through these practices, and they can gain power in their lives and in the hunt through these practices. An unknown Bushman of today tells us, "No more do we Bushmen hunt in these hills. The fire is cold. Our songs are quiet. But listen carefully. You will hear us in the water. Look carefully. You will see us in the rock." The ancient paintings often include characterization of hunters and animals such as rhinoceros, elephant and a variety of antelope species (resembling impala, kudu, and eland, all present day inhabitants of the region). The Bushman kinship system reflects their interdependence as traditionally small, mobile foraging bands. A band consists of 25 to 60 persons, from several families who are often related. They use the Eskimo kinship system, with the same set of terms as in Western countries, and also employ a name rule and an age rule. The age rule resolves any confusion arising around kinship terms, because the older of two people always decides what to call the younger. According to the name rule, if any two people have the same name, for example an old man and a young man both named /Twi, each family uses the same kin term to refer to them: Young /Twi's mother could call Old /Twi "son," Old /Twi would address young /Twi's sister as his own, Young /Twi would call Old /Twi's wife "wife," and Old /Twi's daughter would be strictly forbidden to Young /Twi as a potential bride. Since relatively few names circulate, and each child is named for a grandparent or other relative, Bushmen are guaranteed an enormous family group with whom they are welcome to travel. Many Bushmen groups have suffered as formerly open land became game preserves or cattle ranches, restricting their access to wild foods, while governments continued to assume that they gathered most of their diet. In 1965, a fence along the Namibia-Botswana border divided the formerly continuous Kalahari foraging lands. During the 1970s, most of the Ju/'hoansi group abandoned their wandering lifestyle to raise loaned cattle in semi-permanent villages. By the beginning of the twenty-first century, foraging supplied around 30 percent of the Ju/'hoansi diet near the village of Dobe, compared to 85 percent in 1964, reflecting the increasing untenability of hunting and gathering in the face of population expansion, overgrazing of wild food plants by cattle, and the availability of alternative lifestyles such as gardening with the government's provision of bored wells. Domestic animals, sugar products, garden produce, and mealie-meal are now major foods. Of grave concern are tenuous land control and the destruction of vital water pumps by elephants. Since the mid-1990s, the central government of Botswana has been trying to move Bushmen out of the Central Kalahari Game Reserve, even though the national constitution guarantees the people the right to live there in perpetuity. The game reserve was originally created in 1961 to protect the five thousand Bushmen living there who were being persecuted by farmers and cattle-rearing tribes. The government's position is that it is too costly to provide even such basic services as medical care and schooling, despite the reserve's existing tourism revenues. It has banned hunting with guns in the reserve and has said that the Bushmen threaten the Reserve's ecology. Others, however, claim that the government's intent is to clear the area—the size of Denmark—for the lucrative tourist trade and for diamond mining. The government resumed its policy of forcing all Bushmen off their lands in the Central Kalahari Game Reserve, using armed police and threats of violence or death. In the reservations, Bushmen can no longer hunt or heal in traditional ways, and alcohol abuse and domestic violence have become common. Many of the involuntarily displaced Bushmen have been forced to live in squalid resettlement camps and have resorted to prostitution. In December 2006, the Bushmen won a victory when judges ruled that their eviction by the government was "unlawful and unconstitutional," and that they had the right to live inside the Central Kalahari Game Reserve, on their ancestral land. They also ruled that the Bushmen have the right to hunt and gather in the Reserve. However, in the following years they were prevented from accessing the borehole which provides water. Finally, in 2011, Bushmen were granted the right to access water on their ancestral lands in the Central Kalahari Game Reserve, both in using the old borehole and in sinking new ones. In Namibia, the primary health threat comes from tuberculosis. In Tsumkwe East, a British aid agency, Health Unlimited, has accomplished what they believe is a world record in treating the Bushmen with "barefoot" doctors in their own villages, achieving an 84 percent cure rate. As nomads, Bushmen find it impossible to come to a traditional hospital for the required six months of treatment. They seem to live far enough away from towns to still be fairly safe from alcohol and AIDS, but given situations like the forced re-locations in Botswana and the development of prostitution as a life-style, this problem cannot be avoided without political intervention to secure their independence. The Bushmen of the Kalahari were first brought to the western world's attention in the 1950s by South African author Laurens van der Post, with his famous book The Lost World of the Kalahari, which was also made into a BBC television series. The 1980 comedy movie The Gods Must Be Crazy portrayed a Kalahari Bushman tribe's first encounter with an artifact from the outside world (a Coca-Cola bottle). The anthropologist and filmmaker, John Marshall, documented the lives of Bushmen in the Nyae Nyae region of Namibia over more than a 50-year period. His early film The Hunters, released in 1957, showed a giraffe hunt during the 1950s. N!Ai: The Story of a !Kung Woman (1980) is the account of a woman who grew up while the Bushmen were living as autonomous hunter-gatherers and was later forced into a dependent life in the government created community at Tsumkwe. A Kalahari Family (2002) is a five-part, six-hour series documenting 50 years in the lives of the Ju/’hoansi of Southern Africa, from 1951 to 2000. ↑ "Leave the Bushmen out of it." Language Log. Sep. 9, 2005. Retrieved December 27, 2006. ↑ "Wrong Term for the Kalahari's People." Washington Post. June 7, 2005. Retrieved December 10, 2006. ↑ Robert K. Hitchcock and Megan Biesele, "San, Khwe, Basarwa, or Bushmen? : Terminology, Identity, and Empowerment in Southern Africa." Kalahari Peoples Fund. 28 December 2000. Retrieved December 10, 2006. ↑ Relocation of Basarwa Retrieved December 10, 2006. ↑ Steve Connor, World's most ancient race traced in DNA study The Independent (1 May 2009). Retrieved October 5, 2011. ↑ 6.0 6.1 Victoria Gill, Africa's genetic secrets unlocked BBC News (1 May 2009). Retrieved October 5, 2011. ↑ John Simpson, "Botswana Bushman fights for survival." BBC News. August 15, 2002. Retrieved November 29, 2006. ↑ 10.0 10.1 Bushman and San Paintings in South Africa. Retrieved November 29, 2006. ↑ "Bushmen forced out of desert after living off land for thousands of years." Daily Telegraph. October 30, 2005. Retrieved December 10, 2006. ↑ Survival International, Bushmen win landmark legal case 13 December 2006. Retrieved October 5, 2011. ↑ Survival International, Victory for Kalahari Bushmen as court grants right to water 27 January 2011. Retrieved October 5, 2011. This page was last modified on 21 December 2016, at 22:56.